I spent some quality time with Ravat's tanks this weekend, and came up with some good news and some bad. The good news relates to the fresh water tank. I scrubbed that tank within an inch of my life (or its life?) and nearly learned how to dislocate my shoulder in an attempt to best manipulate the scrub brush. After many passes with a dish detergent solution the tank came out spotless. It looks fantastic, and I'm pretty confident that it can be reinstalled. That's a nice cost savings, and even better, no need to fabricate a retaining system. The black water tank on the other hand remains a stubborn dark cloud. I was able to get the frozen access port off with some cautious punch and mallet tapping. It was stuck because someone had cranked down on the access port without the gasket in place. No gasket on a black water waste tank. Brilliant! Really, just brilliant. I can probably order a new gasket and cover from Kracor, so I'm not concerned about that aspect. 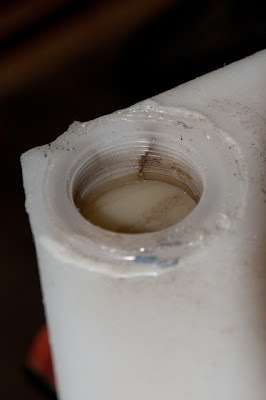 I removed the output fitting and looked closely at the threads in the tank. It appears that there is a crack on the inside of the tank in the fitting threads, most likely a result of over-tightening it at some point in history. The fitting is installed very close to the tank's edge, so I'm not sure how feasible a repair will be. I plan to call a few RV repair shops to ask if they know who can look at this and whether or not it can be repaired. My suspicion is that this tank will need to be replaced. If that suspicion proves correct I'm in for a real joy. I have already spent hours pouring over the Ronco, Kracor, and other tank catalogs. I can't seem to find quite the shape and size I need, although I haven't given up yet. I'm just getting tired of staring at line drawings of tanks. This is one drawback of not having a Catalina which everyone has documented and continues to make replacement parts for. The CS is an incredible boat, but there are some things that force you to get your MacGuyver on and make something happen. The waste tank may prove to be one of those things.